Double Wide Pocket AV Floor box with room for up to four duplex receptacles or up to 24 low voltage devices. 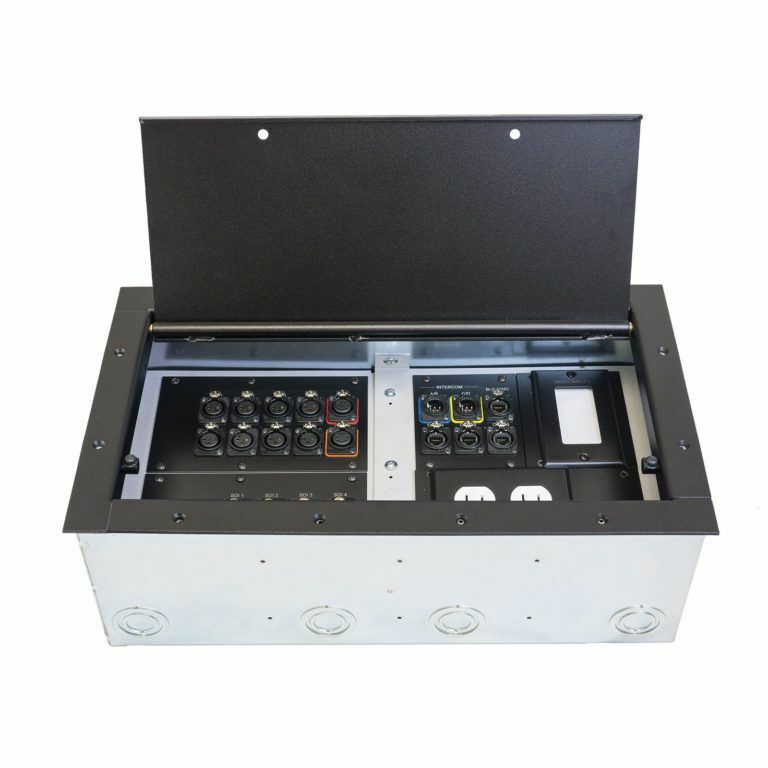 Double-Wide AV floor box with room for up to four duplex receptacles or up to 24 low voltage devices. The lid will close & the chords will come out the front section. Double-Wide AV floor box with room for up to four duplex receptacles or up to 24 low voltage devices. The lid will close, the chords will come out the front section. This has a second small door that lifts and closes shut when not in use to prevent your heel from getting stuck in the opening. For wood or concrete. • any combination of the 4 panels, like (1) #PE series and (3) PNL-100 series. CLICK HERE TO ORDER ALL THE AVAILABLE CONNECTORS. Arnev Products extra large-sized Stage Pocket, the Double Wide Stage Pocket, is a standard general use vertical slant panel flush stage pocket. Pocket has an extra large capacity inter-changeable panel system which permits easy custom connector/panel configurations. Utilizing Arnev's "Connectrix" System will allow mounting of up to 24 "Connectrix", Neutrik®, Switchcraft®, and/or Custom Connectors in the Double Wide Stage Pocket. 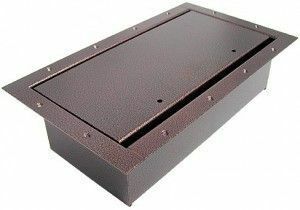 All Arnev Double Wide Stage Pockets are welded steel construction, with a 1/8" (nominally 10 ga. (.135")) thick CRS steel Lid, a 1/8" (nominally 11 ga. (.120")) thick CRS steel Mounting Flange, and a 16 ga. (.062") thick Pocket Body. The Double Wide Stage Pocket resists bending under even the most severe stage loads. Removable spring loaded hinge pins permits easy exchange of lids for carpet lids, locking lids, standard lids, and other custom application lids. A generous cable way slot of 3/8" x 16" permits easy cable exit from the stage pocket, even for large gauge cables. Two cableway slot channel closures closes the slot when not in use. The Double Wide Stage Pocket has an easy installation into 16.8" x 8.5" cutout in the stage floor. 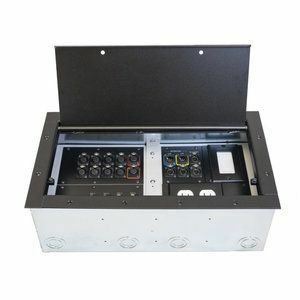 Open easy access from top or back of the Double Wide Stage Pocket to connector panels makes for easy installation. 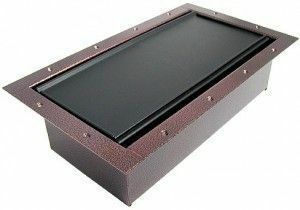 A scratch/wear resistant finish, oven cured powder coat is electro-staticly applied inside and outside the entire Stage Pocket. Decorator neutral Antique Copper Vein or Textured Black finishes are standard. 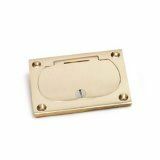 A Solid Brass Lid and Mounting Flange as well as Solid Stainless Steel Lid and Mounting Flange are also available by special order. The Double Wide Stage Pocket's solid rubber Lid Stops cradle the lid to prevent lid rattle. Arnev's Standard Vertical Slant Panel Stage Pocket Systems offer "Connectivity" Solutions with a flexible, reliable, and simplistic design. The flexible design of the Standard Vertical Slant Panel Stage Pocket Lid, Mounting Flange and Pocket Body along with Custom and Prefabricated Aluminum "Connectrix" (Neutrik®/Switchcraft® combo cutout) Panels, Switchcraft® Panels, and our large selection of "Connectrix" (Neutrik®/Switchcraft® combo cutout), Switchcraft®, and Custom Connectors allow the Stage Pockets to be installed in many different applications. These applications include educational, institutional, and liturgical settings. Within these applications various audio, communications, control, data, electric AC power, video, and voice terminations are possible, allowing for a complete Stage Pocket System. Arnev's Standard Vertical Slant Panel Stage Pockets are available in a variety of sizes (Mini, Half, Full, and Double Wide) making them flexible in both form and function and able to meet your individual requirements. All Standard Vertical Slant Panel Stage Pockets are UL Listed except for the Mini Pocket. The “Connectrix” system connectors may be used in any of the “Connectrix” panels utilizing the popular mounting pattern of the Neutrik “D” and Switchcraft “E” series mounting patterns. Connectors using the generous rectangular “Connectrix” cutout will add to a growing array of adapter-mounted standard connectors. The adapter mount is plastic and provides ground isolation between the panel and connector. Click on the links above for our current selection of stock “Connectrix” system connectors. When ordering, please specify model number and type of connector as well as panel model number (#PNL-100 Series, #PNL-120 Series, or #PSW-100 Series) the connectors will be loaded into. *NOTE: Specific High Density (HD) and Sub-D pattern connectors will require either 2 or 3 “Connectrix” Horizontal Spaces or 2 or 3 “Connectrix” Vertical Spaces, depending on connectors selected. Connectors may be loaded into panels with nutcerts and nut/bolts or black aluminum pop rivets. Many pre-cut stock #PNL-100 Series, #PNL-120 Series “Connectrix” System connector panels and #PSW-100 Series Switchcraft® connector panels are available for the Double Wide Stage Pocket. Standard "Connectrix" and Switchcraft® Panels are created from high strength, tough, aircraft aluminum alloy (6061-T6) that is 1/16" (.062") or 1/8" (.125") thick. The standard panels mount with (4 or 6) self-tapping screws. Each panel is CNC machined to precisely mate with the designated connectors and in the pocket mounting holes. Each Standard "Connectrix" and Switchcraft® Panel is finished with oven cured semi-gloss black powder coat. Most panels provide header space for custom engraving which is fast and easily accomplished on a separate dedicated CNC engraving machine. The finished panels show bright aluminum in the engraved characters and need not be back filled. Arnev standard panels are flat, strong, and rigid like the typical thinner mild steel panels. Because the panels are machined and not punched they stay flat and undistorted unlike punched panels which distort in the punching process. The machined “Connectrix” style cutouts combine popular mounting patterns of the Neutrik “D” series and Switchcraft “E” series connectors with a generous rectangular cutout that mates with a growing array of adapter-mounted standard connectors. The adapter mount is plastic and provides ground isolation between the panel and connector. Using the “Connectrix” system panel it is possible to mount any combination of modular jacks (RJ45, RJ11 etc. ), BNCs, dual RCAs, mic jacks, speaker jacks and numerous other standard connectors without a single custom punch. This system provides for more connectors and mounting options in stock standard Arnev panels. The benefit is faster order turn around and lower cost. Less custom fabrication for custom spec results with off-the-shelf stock prices. EXTRA LARGE CAPACITY: The Double Wide Stage Pocket accomodates #PNL-100 Series Panels, #PSW-100 Series Panels, #PNL-120 Series Panels, #PE Series Panels, and #FP3E Series Panels in an interchangeable multi-panel system making for easy custom configurations. Four (4) optional #PNL-100 Series Panels or two (2) optional #PNL-120 Series Panel will mount up to 24 "CONNECTRIX", Neutirk®, and/or Switchcraft® type connectors*. Four (4) optional #PSW-100 Series Panels will mount up to 24 Switchcraft® type connectors. DURABLE CONSTRUCTION: Welded steel construction of Double Wide Stage Pocket Lid, Mounting Flange, and Pocket Body resist bending under even the most severe stage loads. 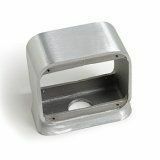 The Lid is made from 10 gauge (nominally (.135")) thick CRS steel, the Mounting Flange is made from 1/8" (nominally 11 ga. (.120")) CRS thick steel, and the Pocket Body is made from 16 ga. (.062") thick CRS steel. 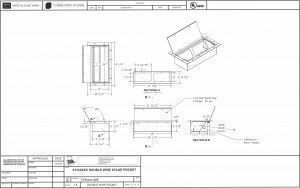 SPRING LOADED HINGE PINS: Removable spring loaded hinge pins permit easy exchange of lids for Carpet Lid (CL), Locking Lid (LL), Standard Lid (SL) and custom application lids. CABLE WAY SLOTS: Generous 3/8" x 16" Cable Way Slots permit easy cable exit from pocket(s), even for large gauge cables. Two Cable Way Slot Channel Closures closes slot when not in use. EASY INSTALLATION: Easy installation into 16.8" x 8.5" rectangular cutout in stage floor. Open easy access from the top or back of the stage pocket allows simple connector/panel terminations. DECORATOR FINISHES: Scratch/wear resistant finish, oven cured powder coat electro-static applied inside and outside entire Double Wide Stage Pocket. Decorator neutral Antique Copper Vein and Textured Black finishes are standard. 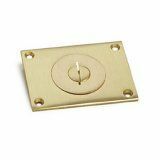 A Solid Brass Lid and Mounting Flange as well as Solid Stainless Steel Lid and Mounting Flange with brushed finishes are also available by special order. If you need a custom color, check out our Custom Color Finishes. You will need to ask for a quantity quote, or a custom color quote at 800-260-1181. Please allow 2-3 weeks for delivery on these custom colors. RUBBER LID STOPS: Rubber lid stops set into recessed mount cradle the lid to prevent lid rattle. DECORATOR FINISHES: Arnev Double Wide size Standard Vertical Slant Panel Stage Pockets come with a scratch/wear resistant finish, oven cured powder coat electro-static applied inside and outside the entire Full Stage Pocket. Decorator neutral Antique Copper Vein and Textured Black finishes are standard. 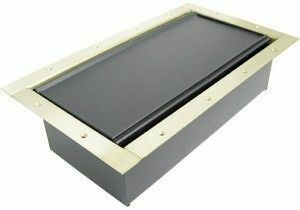 A Solid Brass Lid and Mounting Flange as well as a Solid Stainless Steel Lid and Mounting Flange with a brushed finish are also available by special order*. 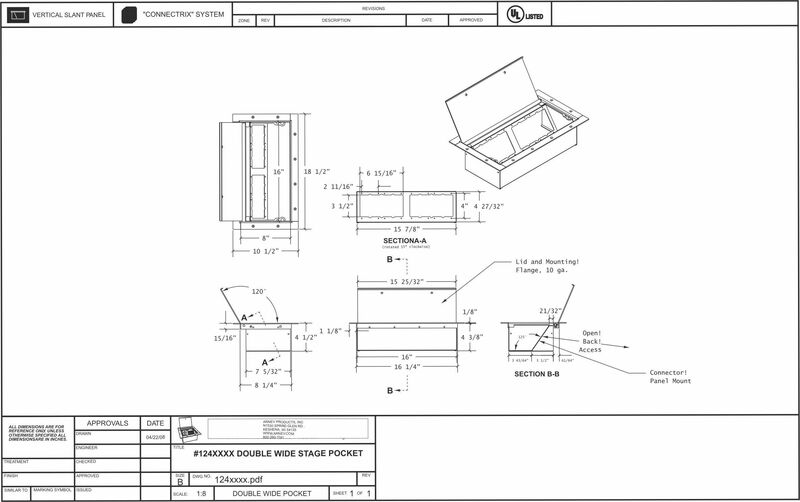 STANDARD POCKET MATERIALS: Arnev Double Wide size Standard Vertical Slant Panel Stage Pocket Lids are made from 10 gauge (nominally (.135")) thick CRS steel, the Mounting Flange is made from 1/8" (nominally 11 ga. (.120")) CRS thick steel, and the Double Wide Pocket Body is made from 16 ga. (.062") thick CRS steel. The exception to this is the Brass Double Wide Stage Pocket Lid which is made from 10 gauge (nominally (.135")) thick Half Hard Solid Brass and Mounting Flange which is made of 1/8" (nominally 11 ga. (.120")) thick Half Hard Solid Brass with a Stage Pocket Body made from 16 ga. (.062") thick CRS steel. UL LISTED: UL Listed compliance Standard 514A file FLOOR BOX 44LK Suitable for raised floor applications. Sales Taxes please note: All our AV boxes are shipped direct to you from our California facility and if you are having the box shipped to you in California we will be calculating the sales tax needed for the transaction. By law, we are required to charge and pay California sales taxes when a product is shipped to a customer in California. Step #1. Choose Small Panel #1 --- FOUR SMALL PANELS NEEDED FOR THIS BOX. Step#2. Choose Small Panel #2 --- FOUR SMALL PANELS NEEDED FOR THIS BOX. Step #3. Choose Small Panel #3 --- FOUR SMALL PANELS NEEDED FOR THIS BOX. Step #4. Choose Small Panel #4 --- THEN CLICK ON CONNECTORS UNDER THE "ADD TO CART" BUTTON BELOW. Step #6. Please choose for Wood, or Concrete pour type WITH OR WITHOUT POWER RECEPTACLE.